We'll keep this forum open for some time to transition and it will then be archived for future access. It's no longer possible to create a new account on this forum. I already registered at the new forum. Just double checking.... this forum is not the same as the former trial version @ https://processingfoundation.trydiscourse.com/, so I should go ahead and create a new account. @GoToLoop that is a nice feature. Were you doing that under Linux? Under Windows. But I believe it's the same behavior if a browser is running under Unix. no line numbers on posted code either. makes it hard to reference. My account - which I crated on the trial forum - existed one the new real forum. So you might not need to do the account creation again, @kfrajer. I second the need for line numbers in code blocks. ...for discussion of this. Discourse uses highlight.js, so the question is if it has an override, and if Discourse's markdown parser correctly passes that through. For bookmarks and saved links, forum migration would just mean changing the domain of those stored links? Does anybody know, for example, from previous forum migrations? Also, is there a timeline for closing and archiving this forum? @GotoLoop: Yes. Discourse does not ignore any language suffix, it only supports specific ones (and they are case sensitive): the py label does not work, but python label does work (or at least, it is recognized by highlight.js and tags the html). @kfrajer: Unfortunately I don't think the plan is to migrate the forum -- I think the plan is to start a new forum with brand new accounts and only new posts. 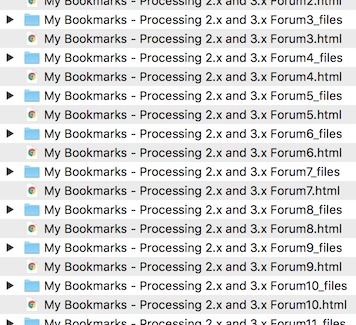 For that reason old user bookmarks must be saved (not exported, just save the bookmark list pages with your private account to html) before they become inaccessible when the forum goes static (no account login) sometime in the coming weeks. I've seen that there is a Vanilla-Discourse forum migration tool, but from looking at the guides it looks like it is a batch migration tool -- I don't not sure it can be used to migrate individual account bookmark data. So previous saved links could still be accessible by running a simple script to fix them? Silly question but you mean to click in my bookmarks in processing and save them? Wouldn't that only save the current page? I have like 30 pages of bookmarks there. Maybe it is a lost case. Not quite -- I mean save each page as a full html document. I have 39 pages, so saving 39 times took about 10 minutes. Then I did the first page again, more recently, to top up. But that is the backup for now. Is there a post in the new forum to related to new forum guidelines? For instance, describing ow delete posts are handled. In fact, should they be flagged to get mod's attention? How is key wording manage in the new forum? Should the new forum app work with WiFi .. only seems to use my phone's cellular network?! Does this mean we lose control of our data when the forum goes static (unable to login, edit posts, etc.) while our content is publicly archived? In my prev comment I was referring to keywords. Are we going to have a countdown for closing this forum? I can't log in to new forum, do we have to create new account? @RichardDL Yes, the new forum means a new user account.